Shooting, Corner kicks, Set plays, Scoring Goals. 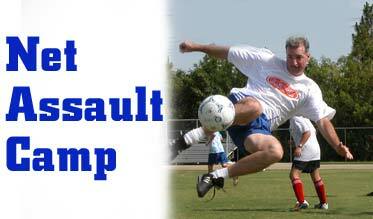 The Quest Soccer Camp Net Assault Camp is limited to only 20 players per week!! Coaches Hearns, Aquila, Shea, and Polo will be conducting the Net Assault camp. That means for every 5 attendees there will be 1 instructor. From rock strewn Appalachian fields to Giants Stadium in the New Jersey Meadowlands, the team of Net Assault coaches have played or coached there. Never before in any type of camp has such intense and forward thinking planning been brought under one program. However you term it we have one word for it all: SUCCESS! The Quest Net Assault Camp is based on the principal of high intensity/short duration. This program is designed to help you and your team score goals. 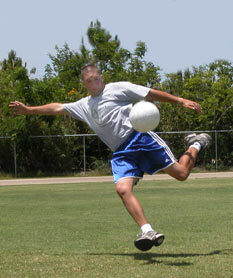 Your physical skill and the mental mindset to score goals is enhanced and developed by Coach Mike and Coach Jason. Both of our camp directors will be on the field throughout these sessions instructing and implementing the Quest Method of Soccer. We train you how to attack in your individual position and to create winning and successful attacks using the supporting players around you. The Quest Net Assault Camp will be limited in enrollment to only 20 players per week. Enrollment is expected to fill fast and attendees are strongly urged to register early. Team enrollments or multi players from teams are encouraged to enroll quickly. Do not miss out on this intense individualized style camp.